Take any movie studio with a strong back-catalogue and an aversion to risk. Put it in a world where virtually every multiplex can screen 3D movies. Now mix in the ability to create some kind of post-production 3D effect. The inveitable result is post-production 3D releases of our favourite movies (or at least the highest-grossing ones). So far, so predictable. But what about Disney? They have arguably the biggest collection of movies that are both well-loved and timeless, so they stand to gain the most in this new world. But while live action movies have an underlying 3D reality, 2D animation doesn’t. So can they make it work? I saw The Lion King in 3D at the Edinburgh Film Festival, mainly because I wanted to know the answer to that very question. But before I get to that, a little bit of context. I’m a fan of Disney 2D animation. At university I got into Japanese anime. Animation is hard work, so when they want to produce 8 hours or so for a full-length TV anime series, corners are understandably cut. Animation sequences get re-used (the classic being transformation sequences), characters can have extended dialogue scenes without even moving their chins, and dynamism is often achieved through ingenious use of cuts, pans, and background streaking. So when something really serious happens, and the camera moves in three dimensions, or the characters move (usually fight) with sudden grace, the effect is profound. After years of enjoying that kind of thing, I picked up some Disney DVDs, and was immediately blown away. Characters are moving in three dimensional space all the time! The use of body language is downright extravagant, and faces actually contort to produce expressions! It was like the climactic high-quality animation I enjoyed the most in anime, but throughout the full run-time of the movie. I’ve been strategically waiting for Buy One Get One Free Disney Blu-ray offers ever since. A lot of people are down on 3D, saying it must be a fad, just as it proved to be before. I once went to a screening of Creature from the Black Lagoon in red/green anaglyphic 3D, and while it was enjoyable as a novelty experience, it was certainly not something you’d want applied to more regular films. The information from the eyes is actively in conflict: one sees red, one green, and the result is some kind of confusing non-colour that conveys information against a background of constant visual dissonance. In comparison, modern 3D is a wonder. Doubtless there is much to learn: new restrictions on panning and editing, optimal methods of production, best-practice depth ranges to use relative to the screen, or new kinds of shot that never worked before. But it turns out that 3D, no matter how good, just doesn’t work for a sizable chunk of the population. I’ve not seen data, but it seems like at least 10%. I suspect this is why Nintendo moved away from 3D being a functional part of games for the 3DS. So when someone opens a review of a 3D film by saying “I’m not a fan of 3D”, my first suspicion is that 3D just doesn’t work that well for them. All of which brings me to the Lion King, now with an extra D.
Given the above, when the preview was announced at Edinburgh International Film Festival 2011, which I was already attending, I naturally had to check it out. I could see what was at stake: if this method of re-selling classic material was deemed by the public to be worthless, it could fatally damage a potentially lucrative new stream of rerelease revenue for Disney. With so much on the line, and with all their collective talent, you could be sure that if it was possible to wring 3D goodness out of 2D animation, Disney would do it. The screening took place in the Festival Theatre, using active-shutter 3D glasses. Recalling that the screen there is rather small (especially given the size of the venue) I booked seats close enough to the screen that it would subtend to my eyes at a satisfyingly immersive 30 degrees (or thereabouts). In this position, with The Lion King my favourite and most re-watched Disney VHS as a child, I felt an exaggerated sense of self-importance: this screening was a test for Disney, and I was the best-placed person to judge. (Clearly this is ridiculous – the real judgement will be measured in the box office when it is released on September 16th). It actually works, most of the time, and when it doesn’t really work, it isn’t actively bad. It’s frequently amazing, and worth paying for. It doesn’t always work, and it’s not always a good idea. 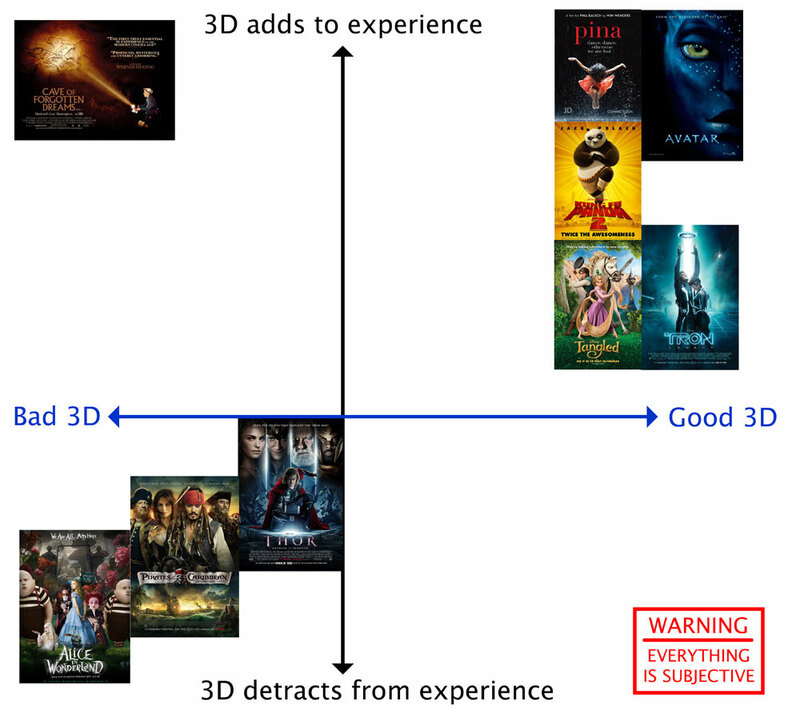 In Thor, Pirates 4, and especially Alice in Wonderland, the 3D was so poor, or unnecessary, or badly integrated into the direction, that it actively detracted from the experience (I note that the last two of those are Disney productions). Tron Legacy (again, Disney!) tried to use 3D like Wizard of Oz used colour – but Tron’s digital world uses such a sparse aesthetic that there’s hardly anything to actually perceive at different degrees of depth, making the whole carefully-created illusion almost imperceptible (excepting all the scenes featuring physical-trail-leaving vehicles, which worked beautifully). The biggest question for three-dimensionalising 2D animation is a similar one: with just lines and blocks of colour, how can 3D do much more than make paper-cut-outs of the characters? Indeed, in Kung Fu Panda 2, flashbacks were conveyed in 2D animation, becoming 3D in exactly that limited way. It turns out there are two answers to this. First, and somewhat obviously in retrospect, the lines defining the characters and their features can be pulled through the z-axis as appropriate, and where sufficient definition of a character exists (as it does for all of the main characters in The Lion King), the brain happily assumes that the areas of colour bounded by these lines must also exist at the appropriate depth. Second, Disney animation frequently (but not always) goes beyond simple ‘cell shading’. A gentle highlight or shadow accentuates the figures, blending in to the main blocks of colour smoothly. While this improves the overall impression of the original animation (at presumably non-trivial cost in terms of additional effort), it really comes into its own when rendered three-dimensional. The impression of depth and physical presence of characters under these circumstances is truly incredible, with results unlike any kind of animation technique I’ve seen before. This naturally raises the other big question: the production was not storyboarded with a 3D version in mind, so surely altering it in this way, while sometimes effective by luck, is very likely to be pointless for the majority of the film? Recall my observation from the start – something that puts Disney animation a cut above the rest is that characters are moving in three-dimensional space much of the time. If someone that hadn’t seen the Lion King saw it for the first time in 3D, they might well assume that a large number of shots or angles must have been specifically added for the 3D version, so great is their use of depth. The opening sequence of The Lion King is uncannily ideal for adaptation in this way, which leads me to suspect that this was precisely why this particular part of the Disney canon was chosen to forge the path. Indeed, that sequence is being used as a trailer for the forthcoming rerelease at 3D screenings right now. But then, as I said, it isn’t always perfect. It couldn’t be. Some scenes just happen to have a lot of mid-ground action, or the lighting means the shadows/highlights aren’t used, and in these scenes the 3D becomes almost unnoticeable. A few scenes (particularly the James Earl Jones In The Sky scene) would almost certainly have been designed differently if 3D had been planned all along. But unlike some of the worst offenders I mentioned above, the 3D is not actively bad in these conditions, it’s simply not noticeable. Just as an escalator can never truly break down, but only become temporarily stairs, 3D-ised 2D animation, at worst, becomes temporarily 2D animation. This entry was posted in observation and tagged 3d, animation, disney, lion king, movie, review. Bookmark the permalink.